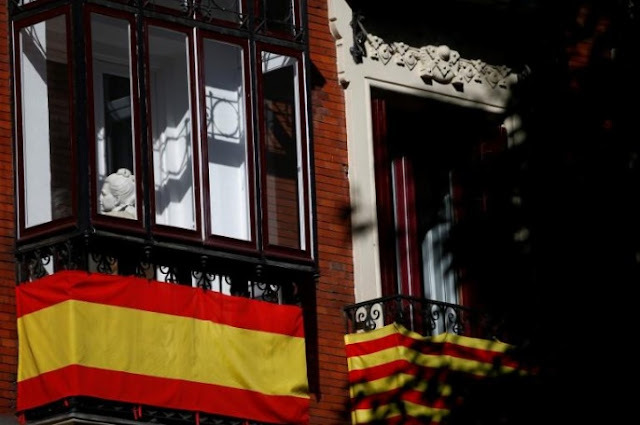 A Spanish and a Catalan flag are hung from the balconies of an apartment building in Madrid, Spain October 13, 2017. MADRID - The Spanish government will take control of Catalonia if regional leader Carles Puigdemont replies ambiguously to Madrid’s question about whether he has declared independence from Spain, the interior minister said on Saturday. Puigdemont made a symbolic declaration of independence on Tuesday night, only to suspend it seconds later and call for negotiations with Madrid on the region’s future. Spain’s Prime Minister Mariano Rajoy has given him until Monday to clarify his position - and then until Thursday to change his mind if he insists on a split - threatening to suspend Catalonia’s autonomy if he chooses independence. “The answer must be without any ambiguity. He must say ‘yes’ or ‘no’,” Spanish Interior Minister Juan Ignacio Zoido told Cope radio. “If he answers ambiguously, it means he doesn’t want dialogue and thus the Spanish government will have to take action,” he also said. Puigdemont, who is holding consultations with local parties to prepare his answer, faces a tough dilemma. If he says he did proclaim independence, the central government will step in. If he says he did not declare it, then the far-left Catalan party CUP would probably withdraw its support for his minority government. CUP on Friday called on Puigdemont to make an unequivocal declaration of independence in defiance of the Madrid government’s deadlines. Such a hardline position has also been backed by influential pro-independence civic group Asamblea Nacional Catalana (Catalan National Assembly). They were joined on Saturday by another key member of Puigdemont’s coalition, Esquerra Republicana de Catalunya, whose leader Oriol Junqueras said they should press ahead with splitting from Spain following an independence vote. The Catalan government said 90 percent of Catalans had voted for a breakaway in an Oct. 1 referendum that central authorities in Madrid had declared illegal and most opponents of independence boycotted, reducing turnout to around 43 percent. “We have an unequivocal and absolute commitment to fulfill the democratic mandate from Oct. 1,” Junqueras said. Under Article 155 of the Spanish constitution, the central government in Madrid can suspend the political autonomy of a region if it breaks the law. This article, which enables Rajoy to sack the Catalan government and call a regional election, has never been activated since the constitution was adopted in 1978 after the death of dictator Francisco Franco. The Spanish government will take control of Catalonia if regional leader Carles Puigdemont replies ambiguously to Madrid’s question about whether he has declared independence from Spain, the interior minister said on Saturday.